This recipe is not meant to incite anger in pizza purists who live for the perfect dough and the wood-fired crust. These are simply good looking, tasty treats that are great for a casual gathering, and can be put together in minutes from bagged and tinned bits of this and that. You need that type of simplicity every once in a while. 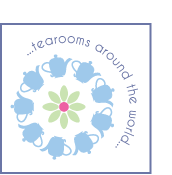 Every homemade offering does not need to be a high wire act leaving the host too worn out to enjoy their own party. The ingredient amounts are a bit vague because it really depends on how you like your pizza. 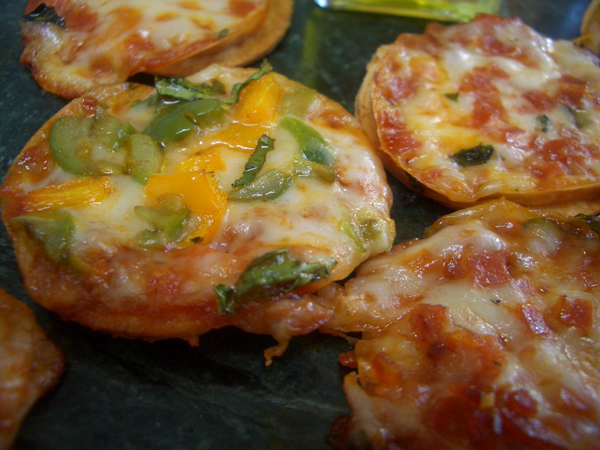 Any toppings you like–I used pepperoni, hot Italian sausage, basil, green olive, and yellow bell pepper. 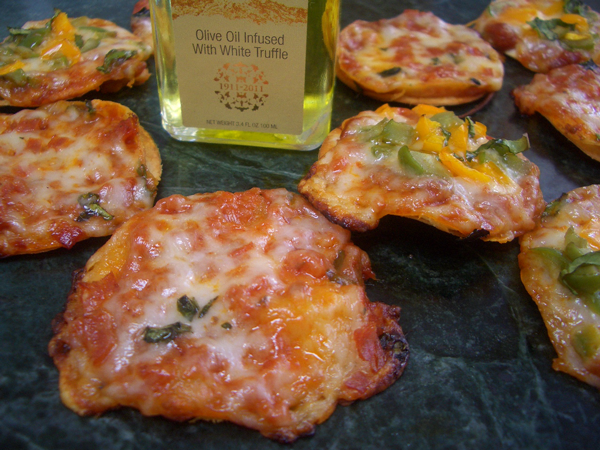 I drizzled the veggie pizzas with white truffle oil. You want the toppings chopped fine otherwise they won’t cook enough. Baking sheet lined with parchment paper. 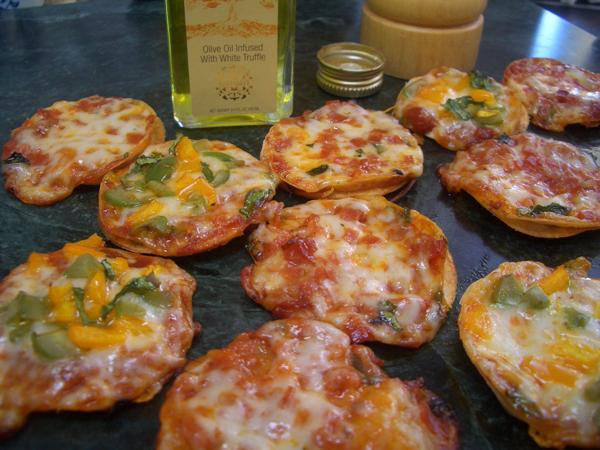 If you use foil you need to oil it or the pizzas will stick. 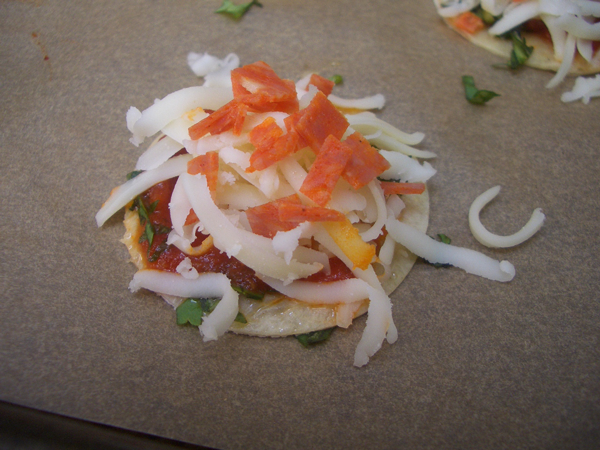 Brush a tortilla with a light coating of olive oil. 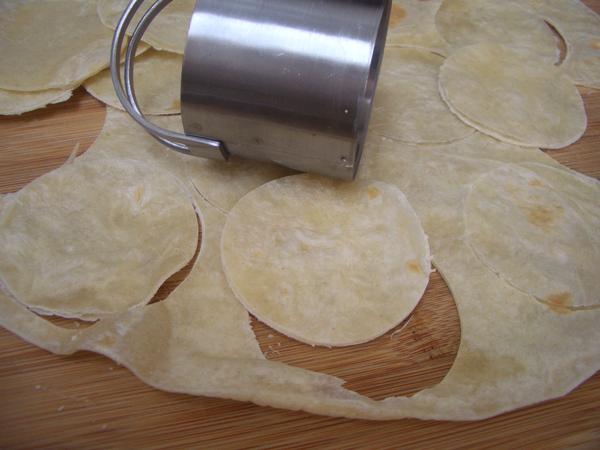 Cut the tortillas into rounds using a 2-inch biscuit cutter. You need something with a sharp edge or it won’t cut through. 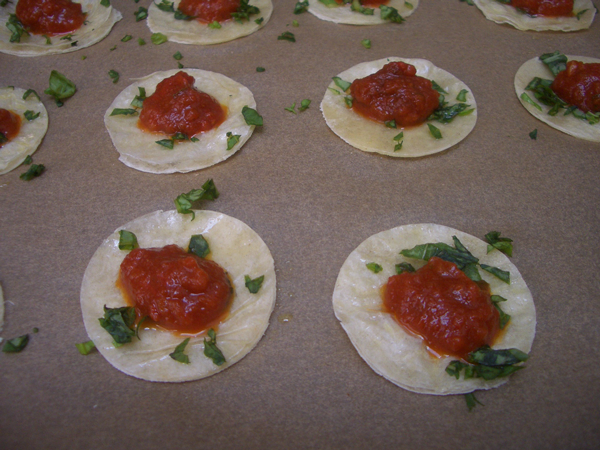 Place the rounds on the prepared baking sheet. 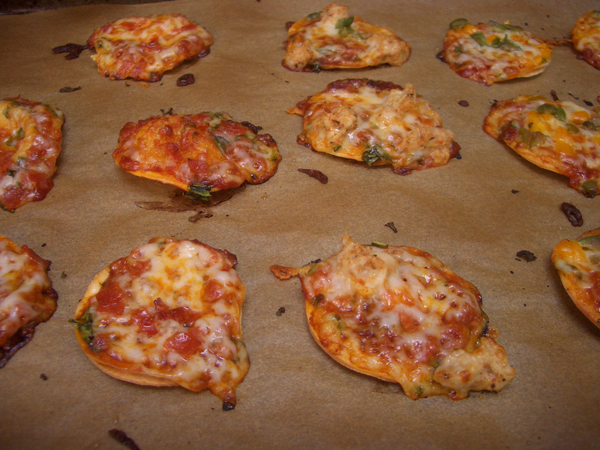 It’s easier to build the pizzas on the sheet rather than try to move them with the toppings in place. 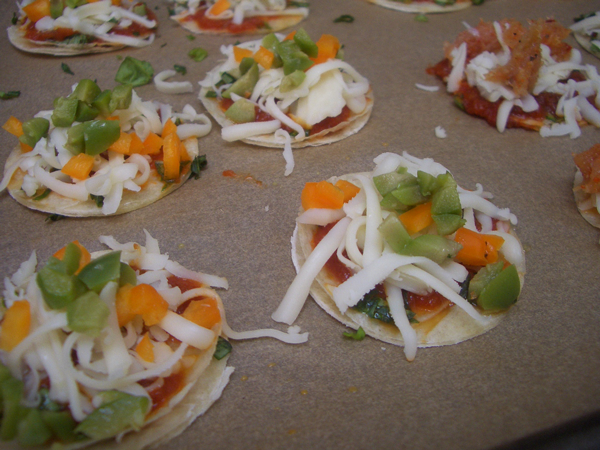 Add your sauce, cheese and toppings in whatever order you like. I sprinkled chopped basil on all the rounds, then added sauce (spreading it out a bit with the back of a spoon), cheese and meat and veg. Pop the tray in the oven and bake for about 5 minutes. They will cook quickly so keep an eye on them. When they are golden and bubbly, remove from the oven. Let cool for a couple of minutes then use a spatula to move them to a serving platter. Serve immediately. Though best when hot, these hold up surprisingly well as they cool.